The last thing Vivian expects to see during a garden party at her family's opulent lake house is the love of her life, Charlie Haverman, standing over the body of Hap, a man from Vivian's past, and clutching a pair of blood-covered scissors. But there's no denying the grisly scene in front of her--or that fact that Hap, who Vivian hasn't seen since he abruptly broke off their fling to realize his dream as a pilot years ago--is dead. Could Charlie have attacked Vivian's old flame in a fit of jealousy? It certainly looks that way, although Viv knows Charlie isn't capable of murder. But with witnesses reporting Charlie muttering angry words about Hap hobnobbing amongst the party guests and her family's hostility toward outsiders, Vivian is going to have to figure out how to solve Hap's murder and save the man she loves...before she loses him forever. 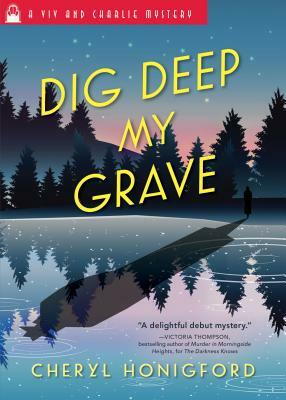 A country rapidly descending into war and old family secrets come together in the third installment of Cheryl Honigford's beloved Viv and Charlie Mystery series.